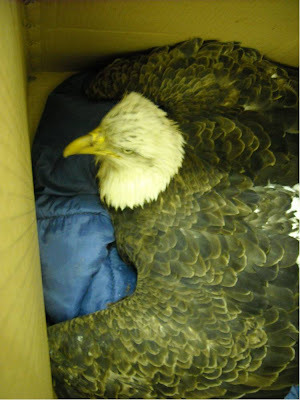 An adult Bald Eagle was admitted from Lincoln County with lead poisoning and a spinal injury. The injury was likely caused by impact such as being hit by a car. It is not unusual for our patients to have more than one problem. Something like a toxin even when not fatal can cause a bird to be weakened, move slowly or be disoriented. Those factors make a wild animal at risk for being hit by cars, shot or even hitting electric lines that they don’t see as well. When a bird comes in with an obvious injury we think, “OK, why did this happen?” “What is the primary problem that caused this injury?’ Caring for wildlife takes sleuthing. It is a lot like in the “old days” when doctors didn’t have the luxury of being able to run lots of tests on patients that allow them to “see inside” the patient through CAT Scans and MRI’s. We do basic blood work and test for toxins and basic x-rays, but the cost mounts quickly and become prohibitive for a non profit such as REGI. We also are not able to talk to the patient or the patient’s family to get a history of the illness or injury. We have to put pieces together to get an idea of what happened. This bird was found in a ditch by a road so we can consider the bird was hit by a car. Had she been found in the middle of a large field or woods that would be less a consideration. We observe a patient closely. Everything from the typical “Do you see blood and where?” “Does the bird stand without help?” “Does the bird fluff up the feathers in an effort to retain heat from its body?” This observation has to be done without the patient realizing we are watching. Birds are very good at hiding their health issues, or bluffing to stay alive in the wild. If they show weakness or injury they are killed or eaten by predators. It is the law of survival of the fittest. Wildlife rehabilitation is a complicated field. There are many similarities to human medicine, but just as many differences. We hope our new patient survives. She is eating and that is a great sign both for lead poisoned birds as those with spinal injuries. She is not yet standing. That is a negative to her prognosis. We will continue to offer her the best in supportive care, a safe warm and low stress place to recover. So many wild patients survive despite huge odds. Wild animals have strong DNA which has been perfected for eons. Only the strongest individuals of species survive in the wild. That serves them well in case of injury and captive survival. As if to underscore the variety of birds we care for, a young family brought a Pine Siskin with a wing fracture. A tiny bird, the wing was likely broken when it hit a window. The wing is in good position. The bird is in good body condition. There is a 90% chance this bird will be released again. The public is always surprised that tiny bones heal well and quickly. Stay tuned for more exciting news coming up next week!